Murrayfield Racers director of hockey Tony Hand is playing down the club’s ‘favourites’ tag ahead of Saturday’s Scottish National League play-off semi-final with last year’s champions Dundee Comets. 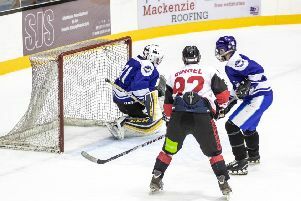 Racers and Comets open the two-day tournament held at Dundee Ice Area (face-off 4.45), and the winners will play either Paisley Pirates or Kirkcaldy Kestrels, who do battle in the second semi-final on Saturday night, in Sunday’s final (6.00). Murrayfield, regular-season league champions, remain undefeated in all SNL-sanctioned competitions, and are on course for an unprecedented quadruple, having already secured a place in the final of both the Stuart Robertson Cup and Scottish Cup. Hand said: “The top four teams in the league have qualified for this tournament, and even though we’ve done well this season, this is by no means a formality. Dundee will be strong and are playing at home. To be honest with you, we’ve been battling a bug in the team. Once one guy gets it, it spreads. We’re just trying to keep everybody fit and ready to go. It’s nothing serious but there is definitely something going around. Regardless of that, we know it’s going to be a tough game and Dundee will be right up for it. “We’ve played Kirkcaldy and Paisley recently and they’ve been really close games, I don’t see us going into this tournament as out-and-out favourites. It’s going to be difficult for the guys – players want to test themselves by playing meaningful games and that’s what this weekend is all about.